The facts on air pollution from nitrogen oxides (NOx) and particulates (PM) are shocking, with motor transport the main offender. Government plans to reach legally acceptable air quality have a target date of 2020, meaning children born today will have started school before they have air that’s fit to breathe. We are calling for urgent action at national and local level, sharing practical solutions, and supporting local campaigners. Every community is entitled to clean air. Campaigning for better, sustainable transport is a vital part of this. 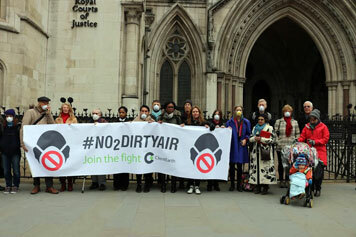 Find other clean air campaigners in your area. With our allies in the Healthy Air Campaign, we helped co-ordinate a lobby of UK MEPs in support of a stronger EU testing regime for vehicle emissions as well as backing the ground-breaking Client Earth legal case against the UK government. As a result, the government has produced a national air quality plan: although we don’t think it goes far enough, cities across the UK are taking long overdue action. Leeds, Birmingham, Nottingham, Derby and Southampton are required to introduce Clean Air Zones by 2020. Greater Manchester is also looking at introducing a Clean Air Zone – read our response to their 2016 consultation. We’ll be supporting local campaigners to demand that their local authorities come up with the right plans, including cleaner, greener transport. Nottingham has pioneered the Workplace Parking Levy. Through our Tracks programme, we are helping other councils, including Cambridge, follow Nottingham’s lead. The Bus Services Bill could be a great opportunity to get cleaner vehicles as part of new local partnerships. In London, we worked with Green Alliance on the Greener London programme. Our demands for early implementation of an enlarged Ultra Low Emission Zone (ULEZ) have been agreed in principle by the new Mayor of London, Sadiq Khan. We’ll be taking part in the consultation on the London ULEZ: and we continue to support local campaigners opposing new road-based river crossings that would simply draw more polluting heavy traffic into the city. While cities have the worst air pollution, it’s a universal problem. We’re supporting Transport & Environment’s work at EU level. We’re continuing to press the Government and Highways England to take air pollution from motorways and major roads more seriously. That includes getting more freight off roads and onto rail, and investing in making existing roads greener, not simply building more. Cycling UK air quality briefing.